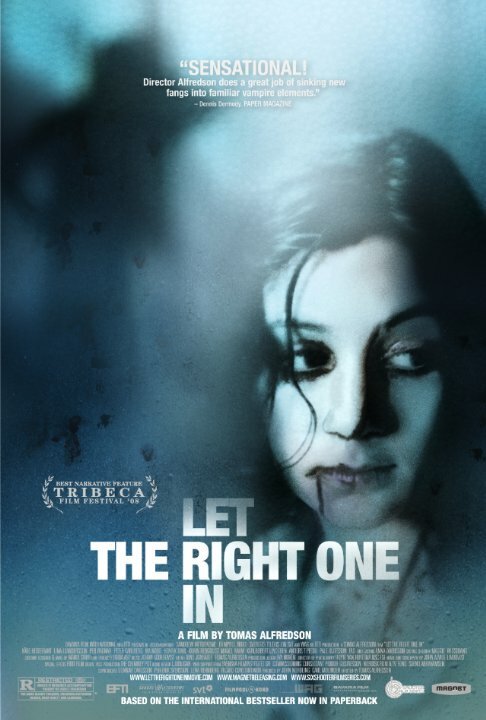 Based on a novel of the same name by John Ajvide Lindqvist (who also adapted the screenplay), Let the Right One In is not your typical vampire tale. First of all, nobody in this film “sparkles”, so that’s already a step in the right direction. At its very core, this film is a love story between two individuals desperate to be accepted for who they are. 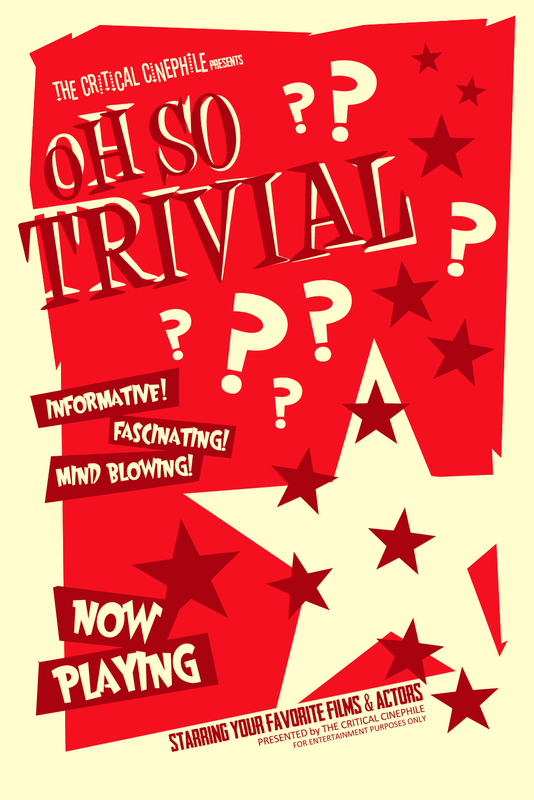 Oskar (Hedebrant) is a twelve-year-old boy who is relentlessly bullied at school. He is awkward and lacks self-confidence, which inhibits his ability to connect and make friends. He collects newspaper clippings of grisly accounts of murders and keeps a hunting knife under the mattress of his bed. He spends his nights alone, either in his room or the courtyard of his apartment complex, and playacts scenarios of exacting his revenge on his oppressors. One night, while out in the courtyard, Oskar meets Eli (Leandersson), who appears to be a girl his same age. Eli and her older companion (who Oscar believes to be her father) have recently moved into the apartment next door. But Eli is not a twelve-year-old girl, and her “father” is just a means to providing her sustenance by murdering locals and harvesting their blood. Oskar and Eli quickly form a friendship, bonded by the fact that they are both disconnected from society. Watching this movie, I became so engrossed with Oskar and Eli’s relationship that I kept forgetting this was a horror film; which made the gruesome instances of death that much more horrific. There is, however, one scene that keeps this from being a near perfect horror film. And that’s the cat scene. If you’ve seen the film you know exactly what I’m talking about. The CGI is poorly done, and the whole thing just comes across as absurd. Luckily it doesn’t last very long, and the film recovers quickly and pulls you back into the story. In preparation for writing the review for Let the Right One In, I decided to watch the American remake titled, Let Me In, directed by Matt Reeves. It’s not a terrible film, but it is further proof that America can’t leave well enough alone. We’ve always got to go mucking about with things that don’t need to be mucked with (don’t even get me started on the decision to remake Oldboy). Let Me In is an almost verbatim, word-for-word, scene-for-scene remake of the original. It was based off Lindqvist’s original screenplay. Which begs the question, what’s the point? If you’re going tell the same story without coming at it from a new and interesting angle, then why bother? The American version does have the addition of a police detective, but he does nothing to either change, further, or enhance the story in any way. It’s amazing how something so similar can be so vastly different. I watched these movies back-to-back and was immediately struck with the difference in the sound of the two films. If you’re used to snowy winters then you understand how quiet the world seems when it snows. There’s less traffic on the road and fewer people out and about; it’s almost as if your immediate world is suffocating under its own frozen landscape. Snow is so prevalent in this story that it’s almost its own character. Alfredson understands that fact and embraces it in his version of the film. Let the Right One In is quiet and unassuming, reflecting the outward personas of the two main characters. There is almost no musical score to speak of and Alfredson allows the silence to permeate his scenes, creating an unsettling atmosphere where we know that something evil is lurking just beneath the surface. There is, however, one thing that Let Me In did better than the original. No cat scene. If I had seen Let Me In without ever seeing the original, I probably would have come away thinking it was a decent horror movie and that would have been that. However, being absolutely mesmerized by the haunting beauty of Let the Right One In left me completely biased toward any attempted imitation. So in all fairness to the makers of Let Me In, in my eyes at least, it never really stood a chance. Lindqvist has created a beautiful story that speaks to the desire in all of us to find that one person we can connect with, who accepts us for absolutely everything we are, fangs and all. If you have yet to see either of these films, please, choose wisely and make every effort to Let the Right One In. This entry was posted in Horror and tagged film, John Ajvide Lindqvist, movie, Review, Sweden, Vampire. Bookmark the permalink. Great comparison of the two films. Let the Right One In is such a unique movie- I sometimes forget it’s a horror movie. The relationship between Oksar and Eli is so pure and sweet. Great review, now I have to watch it again! Oskar and Eli are one of the most compelling couples I’ve ever seen in film. Now I want to go watch it again too! Great review. This was my birthday movie 2008 and I loved it. I walked out on Let Me In, sorry to say, but I couldn’t take it. And Old Boy remake – ugh! I watched for 10 minutes and turned it off. Absolutely horrible. I don’t know why Hollywood insists on trying to improve upon near perfection. Same here, they always screw it up. If they remake the Wild Bunch I will be very upset. I really WOULD like to hear you start in on Spike Lee’s Old Boy. I thought it was one of the worst films of 2013. I’ve come to accept the fact that Hollywood suffers from the compulsion to adapt everything sacred under the sun–fine, whatever–but to have such a lame piece of work, totally uncharged, unfocused, and insipid in all the wrong ways–for a film like that to come from one of America’s angriest filmmakers (I guess, now formerly angriest) is a damn shame. Spike Lee has really lost his way. Those days of Do the Right Thing and Malcolm X are long gone. Goes to show that maybe Tarantino isn’t so far off with his theory of auteurs growing old. You just lose that edge. lee certainly has. Although, it should be noted that 25th Hour is a fine piece of work. Probably his last great film–notwithstanding The Inside Man. But that was more of a fun flick, than a film. First off, fantastic new look. It is quite awesome! I have a problem. I cannot for the life of me remember which version I watched. I know that I enjoyed it, but that is all I can really recall. This is a perfect horror film because it manages to not only have all the perfect ingredients, but it also makes you care about the characters who are involved. Movie magic…. Thanks for the compliment on the new design. It’s still a bit of a work in progress, but I like the direction it’s taking. Btw I gave you a shout-out on my About Page ’cause I’ve got mad respect for your site sir! Oh wow, that is truly an honor. Just checked it out, thanks so much! That cat scene is a bit goofy, but everything else is still pretty wonderful. Especially the little friendship at the center. Handled with such tender love and care. Good review. The cat scene was in the book, so I understand Lindqvist’s desire to leave it in his screenplay, but it certainly did not transfer well to the big screen. I need to find the original film. I’ve seen the remake and thought it was ‘OK’, but didn’t quite capture the novel for me. Thanks for writing this – I otherwise would never have known there was an original out there to look for. -ps, a very well written review. It’s currently available for instant viewing on both Netflix and Amazon Instant Video. This version does a much better job of capturing the disturbing nature of the novel, and is really worth watching. I hope you get a chance to check it out. I love this!! I love the way you’ve written this, and I totally get what you say about the cat scene…almost like that part in Darren Aranofskys the black swan! Pointless! And takes from the film. I also agree with being obsessed/engrossed in the relationship of both characters!! I was really passionate about this film so I’m pleased it shows in my writing. Thanks so much for your comment! LOOOOOOOOOOOOVE this movie! Great post!